Samsung Galaxy J6 of Nadine Lustre vs Huawei Nova 3i of James Reid, Who Has The Better Smartphone? 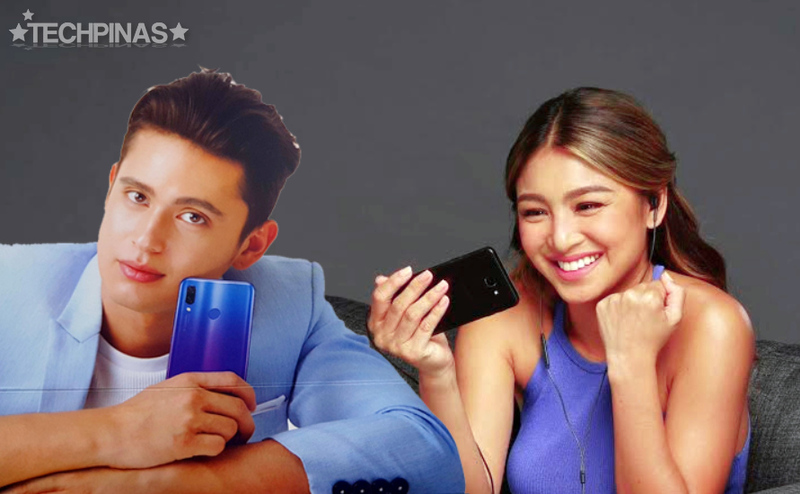 For the first time since they started to be tapped as smartphone celebrity endorsers, Kapamilya sweethearts James Reid and Nadine Lustre have gone separate ways in the handset models that they promote. In 2016, they jointly endorsed Cherry Mobile Flare Android smartphones and even joined mall tours of the Proudly Pinoy company across the country. In 2017, the two surprised the public by abruptly shifting gears and endorsing Motorola handsets, which were being distributed in the country by Lenovo Mobile. This year - 2018, the love team has obviously decided to do a stunning 'tech split' by choosing different brands and smartphones models to hold and represent. In June 2018, Nadine Lustre was formally introduced by Samsung Mobile Philippines as the new face of Samsung Galaxy J6. One month after, James Reid was shown in television commercials officially endorsing the all-new Huawei Nova 3i Android handset. Since these two celebrities rose to stardom at exactly the same time - thanks to their effective love team, I'm sure their fans are now wondering which of the above-mentioned midrange Android smartphones they should get as a sign of support to this charming duo. If you're one of them and you have chosen to rely on technical specifications and suggested retail price as your main barometer in making your decision, I made this side-by-side specs comparison table featuring the Samsung Galaxy J6 2018 of Nadine Lustre and the Huawei Nova 3i of James Reid for you. Dimensions: Samsung Galaxy J6 has a smaller footprint than Huawei Nova 3i but the latter is thinner. Weight: The Galaxy J6 is lighter by 15 grams. Display: Huawei Nova 3i has obvious superiority in this aspect. Its IPS screen is far larger and even has a higher resolution. That said, I'd like to note that the SuperAMOLED display of the J6 is more energy efficient and - in general - has better viewing angles. Front-Facing Camera: They're different in this regard. One has a higher resolution Dual Front Cam with Depth Sensor for bokeh effect while the other has a great low light selfie snapper with Soft LED flash allowing you to take self-portraits in low to zero lighting conditions. Rear Camera: Galaxy J6 as a single 13 MegaPixel camera with wide f/1.9 aperture for good low light performance while Nova 3i has a Dual 16MP + 2MP combo delivering virtual shallow depth of field effect. Video Recorder: Both handsets offer the same maximum video capture resolution and frame rate. User Interface: I'll leave this to user preference. Samsung UI is more familiar because of the Korean Giant's earlier popularity but I think Huawei's EMUI is a bit more feature-packed. But that's just me. Internal Hardware as a Whole: There's almost no competition. Huawei Nova 3i is the clear winner here - bar none. microSD Card Slot: Here, the winner is Samsung Galaxy J6 because it's dedicated. No need to sacrifice Dual SIM capability just to get more storage space. Battery Size: Nova 3i has the higher capacity pack -- but this isn't a guarantee that this model will also have the longer uptime. We'll have to test both phones first to know which one has a more extended battery life. 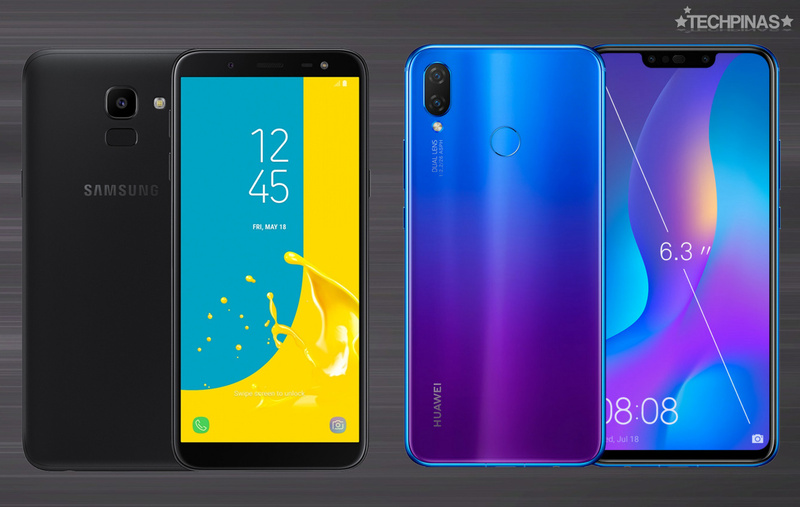 Connectivity Options: The two phones are largely similar in this regard -- with Huawei Nova 3i having a slight edge because of higher LTE Category support. Privacy and Security Features: Galaxy J6 and Nova 3i both feature a Fingerprint Scanner and Facial Recognition. For me, it's a tie. Design and Build Quality: Here, again, it's a matter of personal preference. But for me, the glass-sandwich look and brilliant color options of the Nova 3i make it more aesthetically pleasing. Protection Against The Elements: Both handsets do not have IP certification for water-resistance. Price: Samsung Galaxy J6 is more affordable by PHP 2,000, which is a considerable amount for students and young professionals who are clearly the target market for both of these devices. Now, to answer the question that I posted on the title of this TechPinas blog post: Between Nadine Lustre and James Reid, who has the better smartphone? Well, clearly, Huawei Nova 3i has better technical specifications as a whole. For me, it also looks better. However, we can't ignore the fact that Samsung Galaxy J6 is also more affordable. I guess the right question for their fans is: Are you willing to spend PHP 2,000 more to enjoy all the value added features that are present in the Nova 3i. If yes, then its all good. But if not, I don't think you can go wrong choosing the Samsung Galaxy J6 either. After all, both handsets are made by tech giants that have been in the mobile industry for so long. So there you have it! That's my opinion on this topic. Let me know yours by posting it in the comments section below or by messaging me on Facebook, Twitter, or Intagram. Cheers!